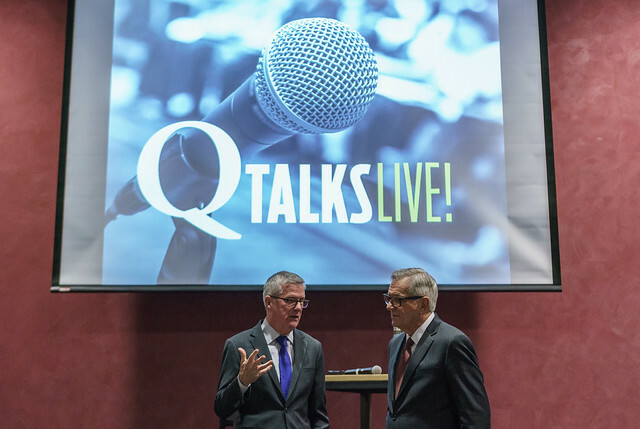 Professor Al Gini at the inaugural Q Talks: Live! event. Gini shared his thoughts on humor at the inaugural Q Talks: Live! event, which is part of the Dean’s Alumni Series. The event also featured Professor Tim Classen unpacking the opioid crisis and Professor Jenna Drenten on how visual social media is changing communication. 1. Humor can be a form of wisdom. Gini added that both seriousness and silliness are critical parts of a meaningful life. Gini added that “joke telling is an attempt to keep at a distance our fear of the unknown, the unanswerable, and the unacceptable.” He later says that humor is not a cure for life, but it can be a helpful anesthesia. Enjoy a joke whenever you can. Never pass up an opportunity to laugh. Remember, laughter is as important as love.